Miller Coors is providing airtime to four small businesses in its 30 second spot at the Super Bowl this year. The beer, known for the Miller High Life Common Sense campaign with a one second advertisement in 2009, will be associated with Del’s Barber Shop in Escondido, Calif., Tim’s Baseball Card Shop in Chicago, Ill., Loretta’s Authentic Pralines in New Orleans, La., Bizarre Guitar & Drum in Phoenix, Ariz. as well as Dan, Miller High Life’s very own no-nonsense deliveryman. To build excitement for the commercial, which will air across much of the country through buys with local market CBS affiliates and owned-and-operated stations, a 30-second teaser ad will hit the air beginning this week. Additional content, including outtakes from the Big Game commercial shoot and information on the four businesses featured in the ad as well as others that are living the High Life, will be available online at www.MillerHighLife.com. Miller High Life scoured the country to identify potential businesses to be featured in the Big Game commercial. From the many qualified companies that stood out, the folks at Miller High Life had the difficult task of narrowing it down to a few small businesses from around the country. 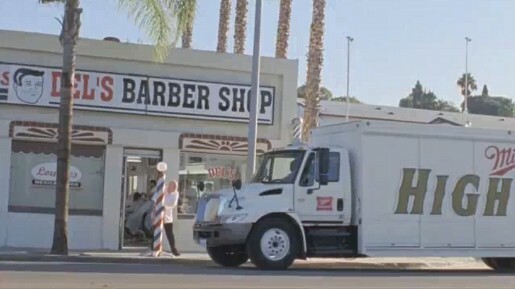 The Small Business campaign was created by Saatchi & Saatchi, New York, by chief creative officer Gerry Graf, creative director/art director Ralph Watson, creative director/copywriter Dan Kelleher, executive producer Diane Burton, senior integrated producer John Swartz. Filming was shot by director Harold Einstein via Station Film, Los Angeles, executive producers Steve Orent and Tom Rossano, producer Eric Liney, director of photography Ramsey Nickell. Editor was Chuck Willis at The Cutting Room Films with executive producer Susan Willis and producer Melissa Lubin. The interactive campaign was developed at iMundo by digital design director Jon Ellis, Flash developer Max Yobst, motion graphics designers Brett Sebens, Tim Fogarty, Itzel Quintero, and digital product manager Christy Behrman.